Welcome to BSA Troop 8, Petaluma, CA. We are in the Miwok District, Redwood Empire Council. We meet Tuesday nights from 7 to 8:30 at The Church of Christ. Troop 8 was established in 1943 and is sponsored by the Rotary Club Of Petaluma. BSA Troop 8 is geared towards high adventure; younger scouts learn scout skills, and participate in hikes, weekend camp trips and summer camp while older scouts challenge themselves with high adventure outings and leadership of the younger scouts. High adventure outings include a 50-mile canoe trip down the Russian River, snow camp in snow caves, and 50+ mile back-pack trips. We're number 1 and we're Troop 8. Camping and Hiking are our given rights. So don't hesitate.. Come and join Troop 8. This week, I challenge all of you to find the word [ teriyaki sauce ] on the website. First to find it and tell the troop guide Jeremy Masterson, at a Troop meeting, will win a special prize! Good luck. * Can be anywhere on the website. * You must know the spelling when you tell the SPL to win. * You tell the tab and section it is under to recieve the prize. * You can only win 3 prizes per year. ~ We try to have our monthly outing on the first weekend of the month. ~ We will try to have a meeting designated for merit badge counseling every 4th Tuesday. ~ We have a pack check for important outings the meeting before the outing. ~ We have our PLC, patrol leaders council, on the first Tuesday of the month 1 hour before the regular troop meeting. ~ The Troop Committee meets the 2nd Tuesday of the month during the Troop meeting. We may have some more in the near/distant future depending on many factors. Please refer to this often in case it changes. Hello, I thought that this poll would be a good idea to see what you guys like to do the most in Scouting. Please feel free to vote, and you are allowed two choices. There are no right or wrong answers, as this is an opinion based. I will try to change the poll weekly and they won't always relate to Scouting, but most of the time they will. 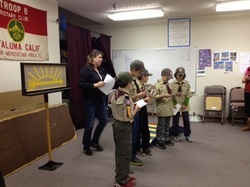 We have 4 new Scouts, that just bridged in from Pack 84. Welcome Trevor, Andre, Shane and Charlie!